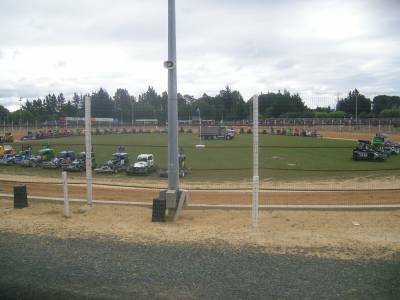 Location - The track is not located in Nelson at all but down the road in Richmond. If you're from a city you wont notice you have gone from Nelson to Richmond. Follow the signs to Richmond but stay on the main highway, the signs to Richmond will take you slightly off course. The road you want to take is at a set of traffic lights and is named Lower Queen Street. You will be wanting to turn right at the lights. Once on Lower Queen Street stay on it, the track is located on the corner of Lower Queen Street and Lansdowne Road. Parking - Parking is right beside the track and was directed when Percy was there. There was no charge for the parking. A few of the locals parked under the trees on the road which led to a fast getaway. Premiere Meeting - The schedule lacks an annual meeting which draws nationwide attention. The best offering is when one of the South Island series comes to town. 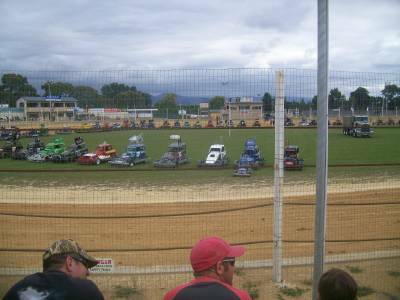 Either War of the Wings for winged Sprintcars or the Super Cup for the Super Saloons. Also worth attending - The traditional Easter meeting also attracts a fair amount of interest from a wide variety of classes. Best spot to sit - The exit of turn two is where the action was when Percy was in attendance. Try getting a seat on the terraces about 20-30 meters from the turn 2 exit. To be honest though there isn't a bad seat on the terraces behind the back straight. Alternatively the small hill behind turn 4 seemed to be popular. 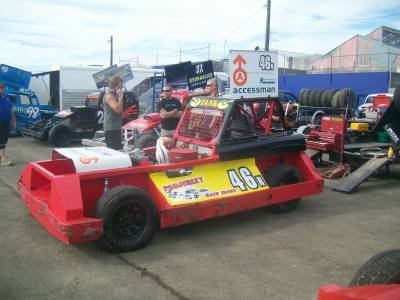 Classes run - Youth Ministocks, Stockcars, Superstocks, TQ Midgets, Midgets, Super Saloons, Production Saloons, Streetstocks, Sidecars. Uniqueness - Whilst not quite circular one can't use the term "straight" with respect to the Nelson track. The track is almost a disc shape. 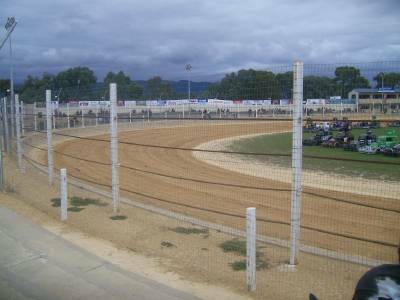 When Perccy visited the unique shape lent itself to being on the pole line around the corners which in turn allows competitors to make the "straights" straighter. However when track conditions allow the track can be very racey. 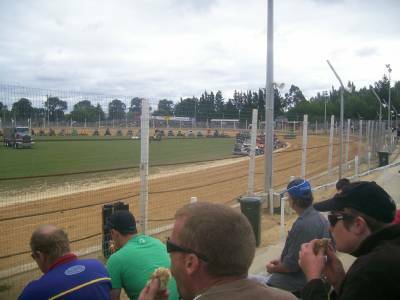 Spectator seating is very close to the track which gets the fans right in the thick of the action. Just be aware it can get pretty dusty.